On February 24, 2016 the Graduate Advisory Council (GAC) hosted the Graduate Student Research Poster Contest sponsored by Kingland. 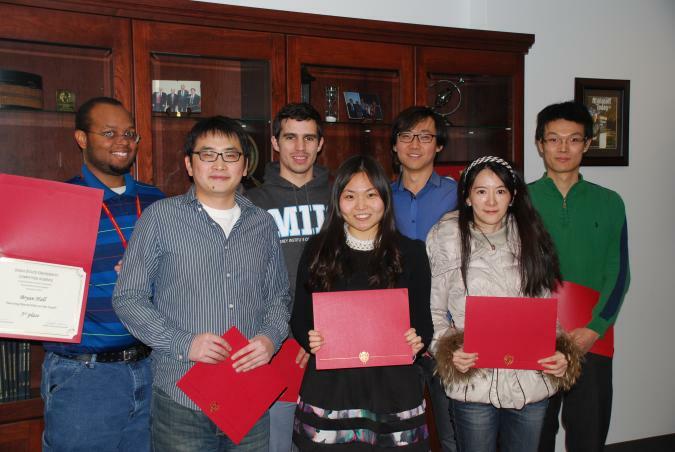 Sixteen graduate students submitted posters on various topics. Back Row - Chuanhai Zhang, Hyuntae Na, Chuan Jiang, Guolei Yang, Bryan Hall, Titus Klinge, Sam Ellis, Matthew Gardner and Nathan Weeks. All the winners and their awards! Thank you to everyone that made this event a success!